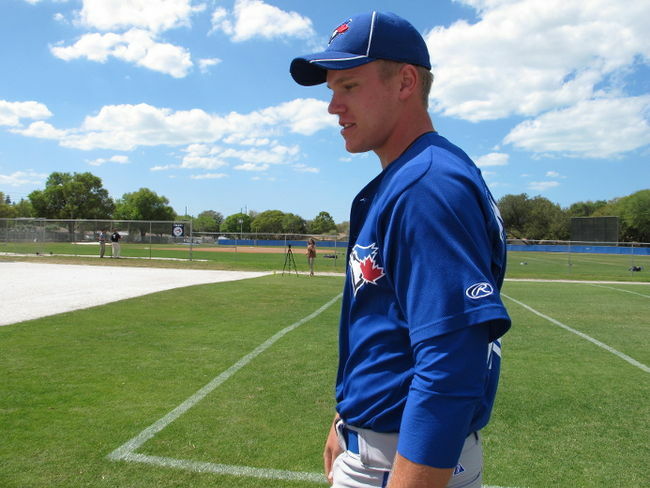 Noah Syndergaard - a guy every Jays fan should be excited about having in the system. STRADER: I had a friend ask me a question: Where’s the AA talent? And we’re not talking double A, we’re talking the GM. I turned to aggressively answer and then thought, hmmmm? What a great question. I’ve actually heard it a few times. Cecil is a Ricciardi guy. So is Romero, Arencibia, and really anyone drafted or signed before October 2009 has to be credited to him. In fact, much of the talent we do see on the present squad, you have to give AA credit for targeting, but you certainly can’t give him credit for drafting them. Lawrie, Rasmus, Escobar, Gose, Drabek and D’Arnaud were all acquired through trade, and come on, anybody was going to get a haul for Roy. We hear about these great draft picks, my buddy asked, who are they? We hear about the piles of money the Jays are pumping into scouting, the system, the signings, who are they producing? Let’s take a look at three, and buddy, calm down, the talent is coming. Noah Syndergaard – Born: August 29, 1992. 6’5” 200 pounds. Right handed. Drafted: First round (38 overall) of the 2010 first year player draft. This is the crown jewel. Where Jake Marisnick is the outfielder people should be excited about, this is the arm to drool over. Syndergaard throws gas, plain and simple. He could hit 98 m.p.h. in High School and is the type of athlete that AA covets – an all around player, he used to lead his high school team in home runs before his magic arm was discovered. Scouting reports today talk about a 94-98 m.p.h. today and a pitcher who can place it wherever he wants – consistently. His curve is also tabbed a plus pitch, and he is said to be, wait for it…developing a changeup. He’s clearly getting more credit for his offspeed ability though as 2011 scouting reports simply drooled about the smoke, and he is consistently being described as more of an all around pitcher in 2012. He’s in single-A Lansing right now, and so far has: 9 IP, 7H, 0ER, 3BB and 14K. Justin Nicolino – Born: November 22, 1991. 6’3” 160 pounds. Left handed. Drafted: Second round (80 overall) of the 2010 first year player draft. Thank the Red Sox. That’s right. The knee-jerk decision that Marco Scutaro was a perennial all-star and deserved that bloated contract after a stellar year as a Jay got us a compensatory draft pick from the division rivals, and Nicolino. The lefty sits in the low-90s with a well controlled fastball and compliments his attack with a two-seam grip and developing curveball and changeup. What’s so great about him? It’s time for the “bulldog on the mound” cliché. Read any scouting report, and they’re all consistent. This kid goes after batters. He dominates the inside of the plate with his fastball and uses his offspeed junk as set up or strike out material. At 19, he made his pro debut in the Northwest League and reportedly looked nothing short of a seasoned veteran. He’s a guy people are expecting to move through the system quickly because he simply isn’t afraid. He is also in single-A Lansing. 6 IP, 4 H, 0ER, 1 BB and 8K. Aaron Sanchez – Born: July 1, 1992. 6’4” 190 pounds. Drafted: First round (34 overall) of the 2010 first year player draft. He has a good frame to grow on and is already showing 92-95 with his fastball and a plus curveball with good downward movement. Reports talk about a kid who gets over excited on the mound, or simply loses focus later in games as he will get out of a good consistent delivery and overthrow. But showing the talent he does at 19, offers a lot to dream about. Consider he’s got two to three full years of minor league work ahead of him to settle himself down and find a consistent delivery and release point, and the Jays could have a star in the making here. The other plus with Sanchez is how many scouts talk about his free and easy delivery in their reports. Injury concerns seem to be low on this kid, always a plus when he’s throwing 95 at 19. Sanchez rounds out the “Lansing 3” as the MINOR LEAGUE REPORT will come to know them: 6 IP, 2 H, 0ER, 4 BB and 7 K.
The next MINOR LEAGUE REPORT will look at the sticks of Outfield prospects Anthony Gose and Jake Marisnick. If you have a prospect you would like described feel free to e-mail a request to thewritefielders@gmail.com.